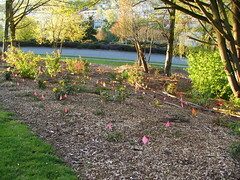 Pink flags marked new plantings in Lewis Park a few weeks ago. Photo by Wendi. Native plants and shrubs were recently stolen from Lewis Park, a small park at the north tip of Beacon Hill near the PacMed/Amazon building and the Jose Rizal Bridge. The plants were planted by volunteers who have been reconstructing this park recently, with support from the City. Vinh Nguyen has been spearheading this project, and reports that on May 28, volunteers found that more than a dozen plants had disappeared from the park, including lady ferns, red flower currants, and evergreen Oregon irises. While parks are public property, the plants within them are not free for the taking, and stealing them is a crime. If anyone knows anything about this crime, please call 911. If you would like to help with the reconstruction of the park, please join other volunteers at the Friends of Lewis Park work party every Sunday, 9:00 am -1:00 pm. Tools and gloves are provided. I kinda wish the police would actually do something punitive. Someone on this blog went to great length to get the Beacon Hill plant thief on video, and after correct ID, I heard the police gave “a slap on the wrist”.